Although the White House has not yet made any official statement regarding the two-week Tar Sands Action that came to an end in Washington DC yesterday with a total of 1,252 arrests, President Obama’s decision to abandon a new air pollution rule on Friday spoke volumes. He affirmed his willingness to ignore the advice of his own government scientists in favor of business lobbyists—even at the expense of the environment and health of the American people. 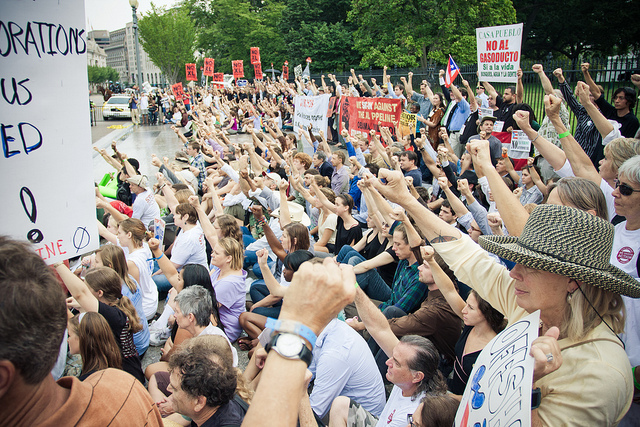 How could the Tar Sands Action organizers leave Washington on that note? Sure, they had just completed the largest environmental civil disobedience in decades. But such an admirable feat would be pointless if all the energy that went in to pulling it off were allowed to dissipate. Thankfully, Bill McKibben announced that the movement will continue organizing, with a Phase Two announcement within 48 hours. The only hint that’s being given so far comes with the advice, “Start by circling October 7th on your calendar.” That date would seem to suggest that the Tar Sands Action and this broader “fighting environmental movement” will be joining the occupation of Freedom Plaza in downtown Washington DC. What started as a protest to mark the 10th anniversary of the invasion of Afghanistan and oppose American militarism abroad may be evolving into something far bigger—perhaps this so-called American Autumn some have talked about? I’ve heard from a secondhand whisper about an email from Bill McKibben that the Tar Sands Action on October 7th will be “synergistic” with the October 2011 movement, whose planned occupation begins on October 6th. The 7th could be a precarious day for actions. By some clocks, it’s the anniversary of the invasion of Afghanistan. It’s also Yom Kippur, the Jewish day of mourning. A thoughtful action, of course, could turn these circumstances into strengths. The recent update was expected. Hopefully our passions will sustain and stimulate local communities. Another hope is of that day’s attendees be aware of october2011.org – and to support them on the day before for their first night of a prolonged occupation! We’re still planning something big for October 7th or 8th – the 7th is the date of the last State Department hearing in Washington, DC – but first we need to go back into our communities to keep building this movement. The White House is going to be watching to see if our sit-in was an isolated incident or whether there really is a movement of people across this country rising up to stop the pipeline. That’s our plan for now. I want to make sure that we use this opportunity to strengthen our connections with each other, and make this a true movement. This is your opportunity to start taking a leadership role in this campaign.